There are several alternatives to filing for Bankruptcy relief. There may be payment plans, or compromise solution which are more suitable to your circumstances. It is not possible to provide a single formula for determining when it is appropriate to file. Bankruptcy can provide a discharge which may relieve you of the obligation to repay certain debts. What consequences this may involve will differ in each individual case. The Texas Board of Legal Specialization recognizes attorneys in various areas of law, who because of experience, training and examination, are awarded certificates of special competence. 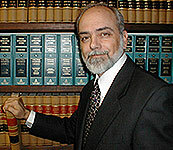 Christian M. Sternat has been Board Certified in Consumer Bankruptcy Law since 1988. It is not required that an attorney be Board Certified in any field to represent a client in a Bankruptcy proceeding. Are all debts discharged? No. There are many debts which are not dischargeable in Bankruptcy. Taxes are not dischargeable in many cases. The rules on which kinds of taxes are dischargeable, and when they become dischargeable are complex. You should consult an attorney to determine these issues for your situation. Other debts that are not discharged include student loans, child support and alimony. The question of non-dischargeable debts is an issue that you should discuss thoroughly with your attorney. Can I keep my house and car? Your house and car may be exempt under the Texas and Federal laws. You may be able to keep them. However, you may need to continue paying the mortgage or car loans which are secured by these assets. What assets may I keep? The Texas Property Code and the Federal Bankruptcy exemptions will provide for protection for various kinds of assets. Usually, your house, car, furniture, clothes and jewelry may be exempt. There are limits to these rules. If you file a Bankruptcy, you must list your assets and give a reasonable value for all items. Does my wife/husband have to file with me? Only a husband and wife can file a "joint Bankruptcy," but a husband does not have to file if his wife files, and vice versa. Generally, each individual must file his own Bankruptcy. A father and son can not file a "joint Bankruptcy" even if they share the same debts. However, a husband and wife may file jointly and both obtain the protection and relief of the Bankruptcy Code in a single case. Whether one or both spouses should file depends on the circumstances of the individuals. If my ex-spouse was ordered to pay certain debts of our marriage in our divorce decree, can those creditors still demand payment from me? Often the answer is yes. If both spouses are liable for a debt during the marriage, generally, both will remain liable to the creditor after the divorce is over. Although the divorce judge may decree that one spouse will pay certain of the marital debts, if that spouse fails to pay, or files a Bankruptcy and discharges the debt, the creditor may pursue the other spouse and recover payment.